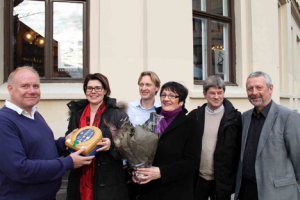 A Norwegian smartphone app developer has donated a HeartSine defibrillator to a sports club in Stavanger, Norway, after he was awarded the lifesaving samaritan PAD 350P for his ground-breaking health and safety application. Trond Hansen, owner and manager of Mellora, picked up the accolade of the country’s best ‘Work Environment Friendly Product’ for his ‘Health Safety Environment Quality’ (HSEQ) app. He was voted the resounding winner by a judging panel and readers of Norway’s ‘Safety’ magazine and website. In the final round of the competition, Trond’s application received more votes than the other four finalists together. The app developer was presented with the HeartSine Automated External Defibrillator (AED) by the RodeKors (Red Cross) at a special ceremony held in Oslo. Trond, who now lives in Spain with his family, decided to donate the AED to the local sports club where he grew up and played basketball as a child. “It’s very touching to hear that Trond has donated his lifesaving defibrillator to a sports club which will benefit, not only the users of the club, but the local community.